Everybody knows them but nobody talks about them – except us! 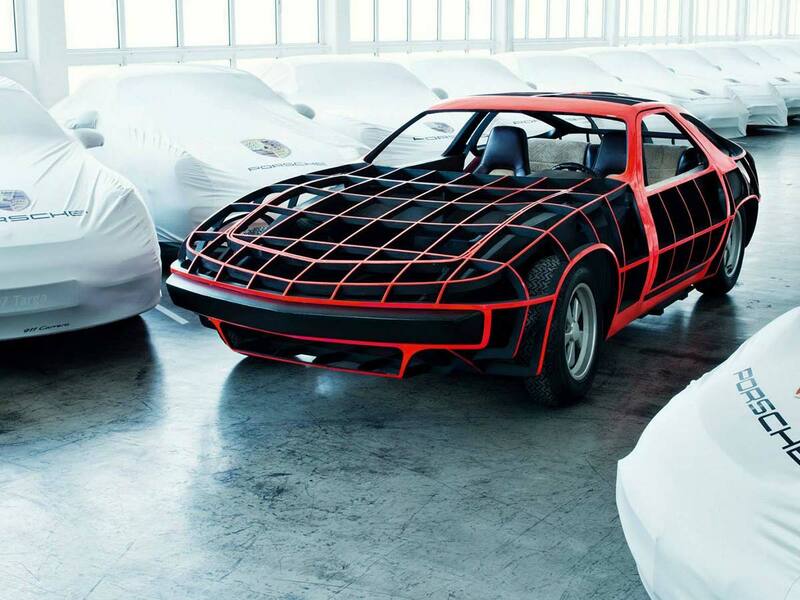 Learn more about five decades of Porsche concept cars and prototypes. 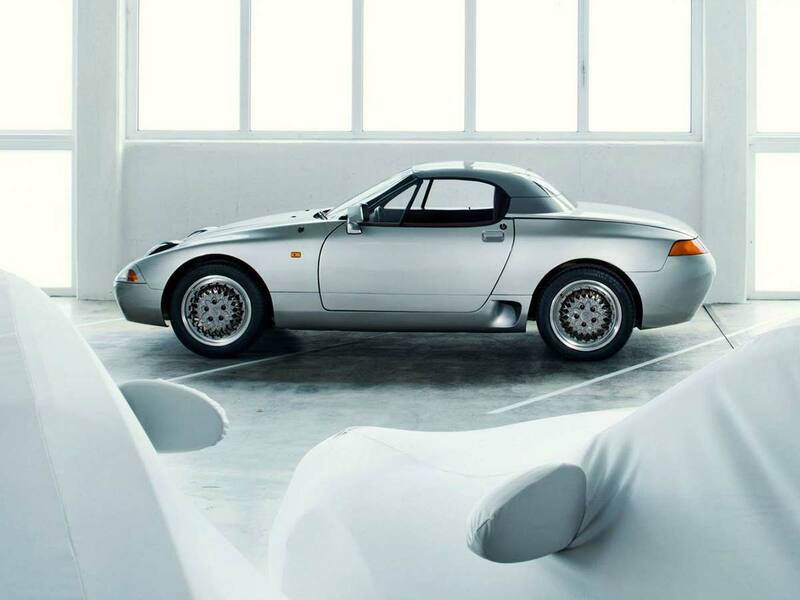 As a living automobile museum, the Porsche-Museum annually presents numerous special exhibitions on specific topics or meaningful anniversaries. 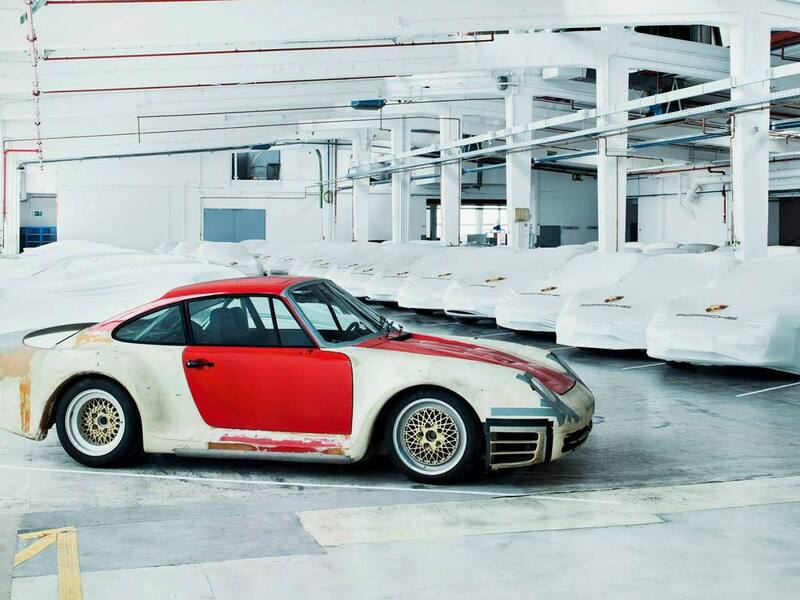 2014, Porsche`s return to Le Mans will be honored with an extensive exhibition. 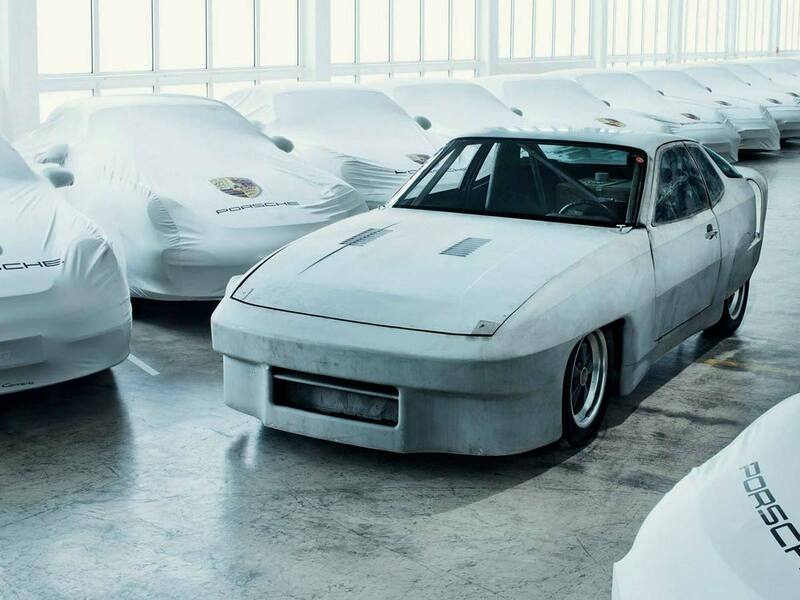 The Porsche museum dedicates 60 years of Porsche concept cars and prototypes with the special exhibition „Project: Top Secret!“. Due to that special anniversary you might miss your personal favorite car in the exhibition. 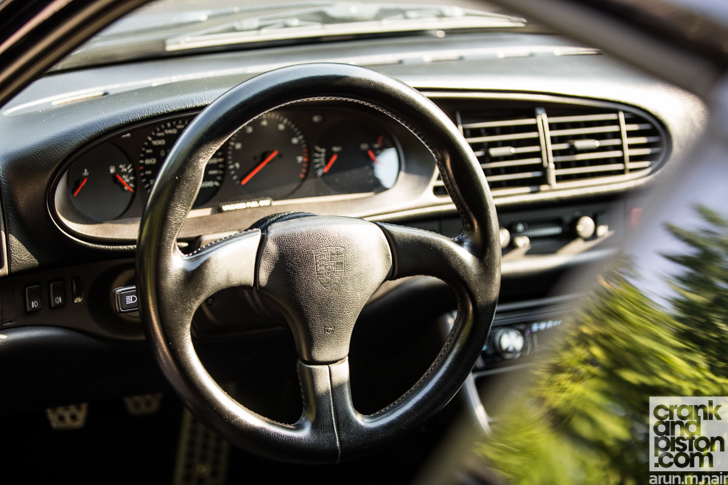 The above is a description from the driver’s seat of a Porsche 968 Club Sport, one of Stuttgart’s more prominent entry-level models and successor to the awesome Porsche 944. 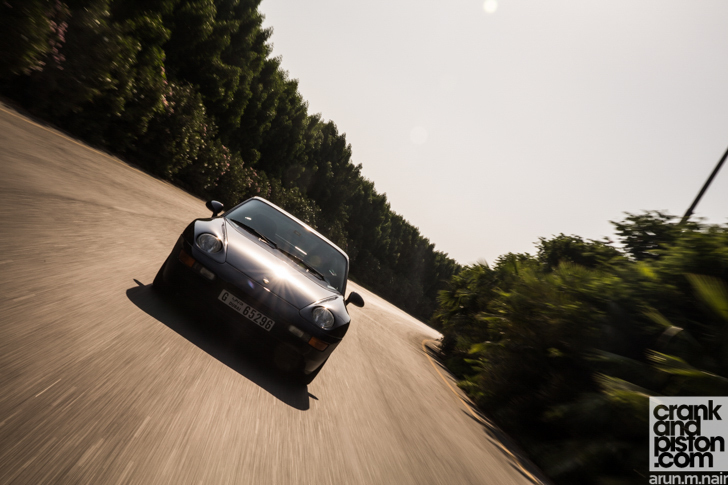 In the early ‘90s, thanks to yet another recession, flashy overpriced sportscars were decidedly un-de rigeur, and company in-fighting – plus a bit of bad press – meant Porsche found itself overlooking the doldrums. 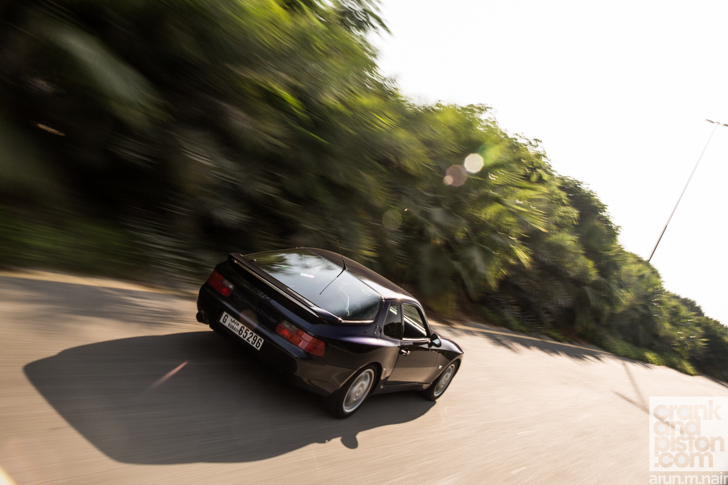 Even the then-new Porsche 968 was being slated for being ‘a bit boring’. 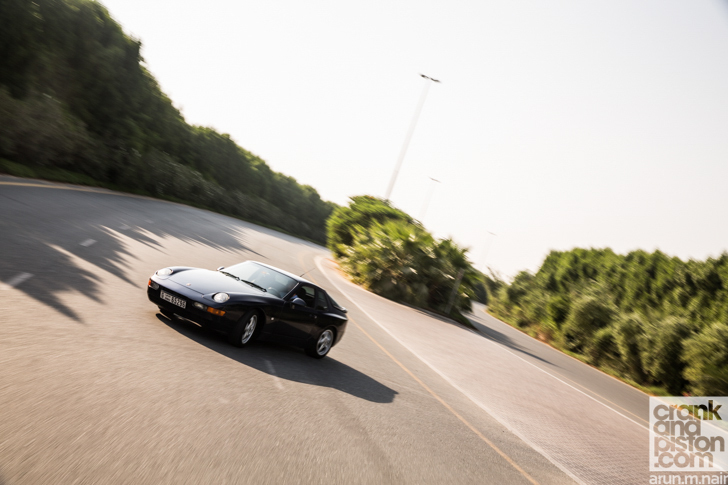 But then, in December 1992, a newer, more lightweight and decidedly more badass Porsche 968 – the Club Sport – was wheeled out to a baying public, which quickly swallowed it up and took said sports coupe to its heart. Unsurprisingly, some 22 years after it first hit the tarmac, the Porsche 968’s stripped out, more dynamic Club Sport counterpart remains amongst the most desirable of Porsche’s exclusive front-engined models. 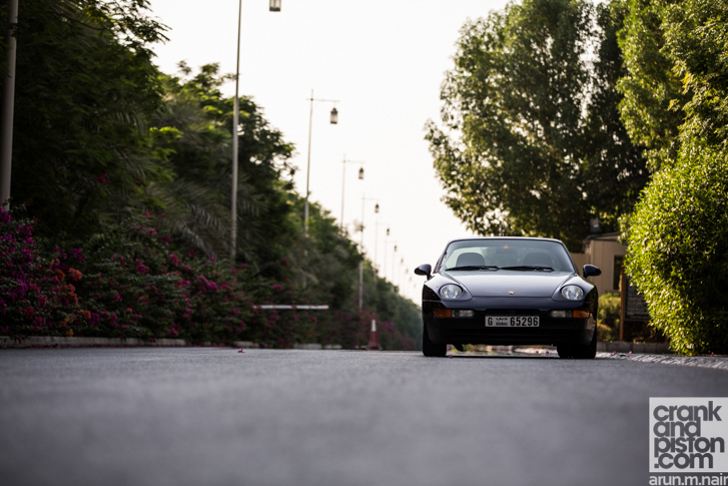 Its heritage, its performance, and its pull as a ‘proper Porsche’ is difficult to resist. 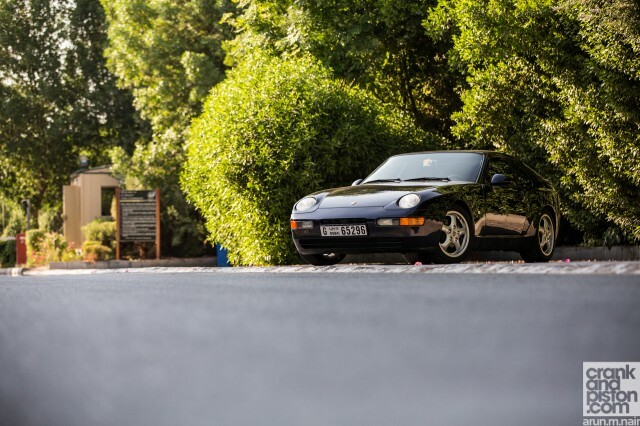 Such proved the case for Marcus Siddons, well-spoken gent and owner of the 1994 Porsche 968 CS you see above and below. And which today, we’re here to shoot. Unusually for this time of year, today is proving a scorcher, crankandpiston.com photographer Arun and I already blinking heavily under our sunglasses and finding solace in the shadows. 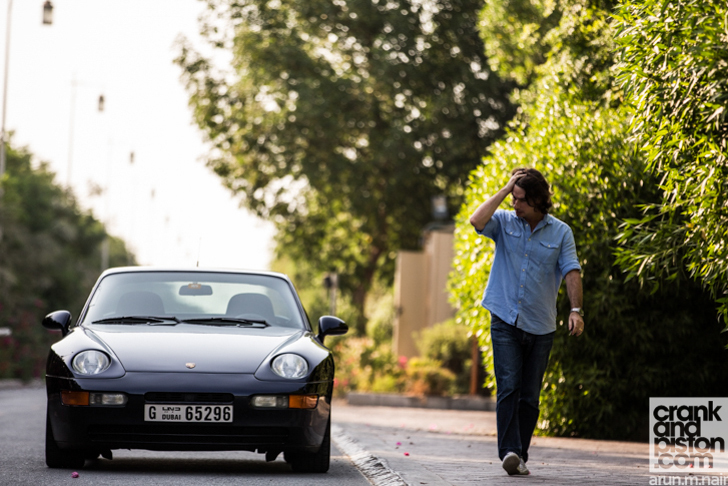 The heat though doesn’t appear to have dinted Marcus’ enthusiasm, and he’s more than happy to dive into the whats, whys, and wherefores of his 968 Club Sport whilst I get my breath back. 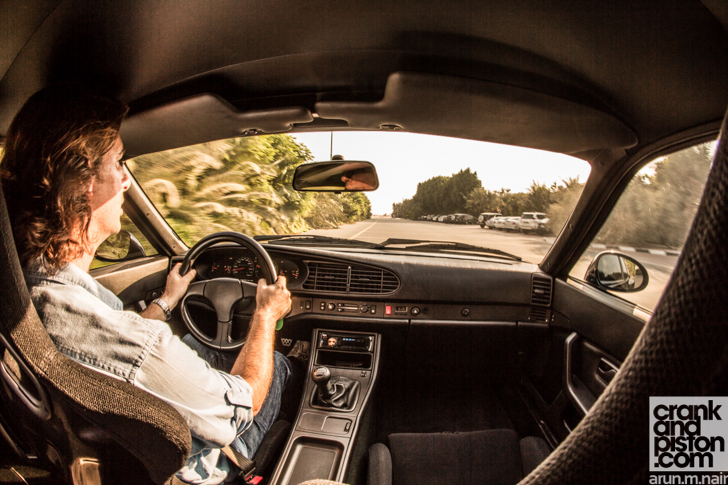 Therein lies an example of Marcus’ devotion to the ‘94 968 CS. And that would just be the first step. Work on the interior included removing ‘some horrible cheap version of 3M screening on the back windscreen’ and replacing it. Small scratches on the paintwork have been eradicated, including repainting the entire roof. Miniscule scuffs to the bodywork have received similar treatment. The biggest was yet to come though, namely the suspension. The effort – and money – has been well worth it though, a beaming Marcus nods. 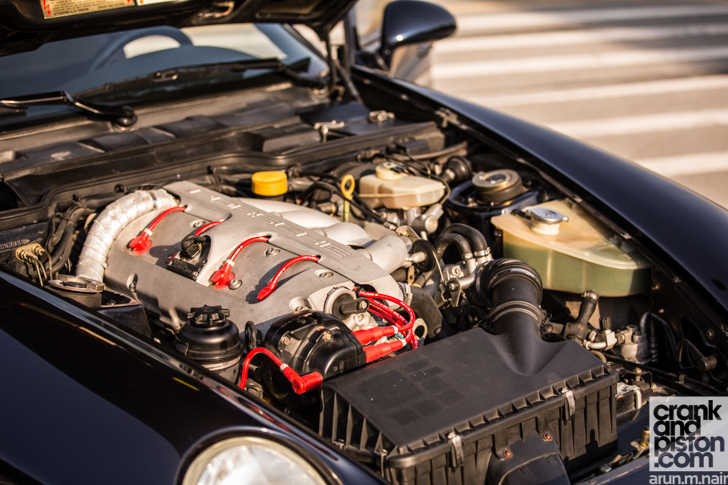 Fresh out the factory in 1994, the 1335kg Club Sport (down 50kg on a standard 968) boasted a front-engined three-litre twin-cam four-cylinder – the most powerful naturally aspirated unit at that time – which produced 240bhp. Said unit was mated to a six-speed manual transmission, rear-mounted in the interest of perfect(ish) weight distribution. 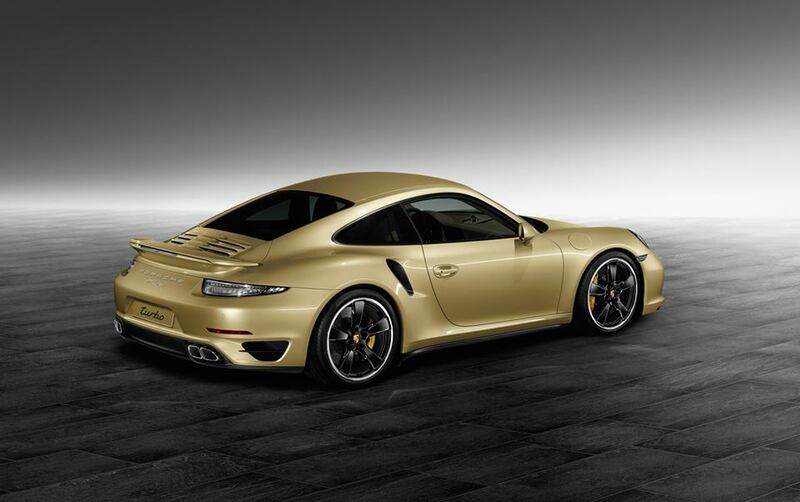 Recaro bucket seats, dropped suspension and 17-inch wheels from the 911 complete the ‘phwoar’ factor. And all of this, quite remarkably, still looks brand new. 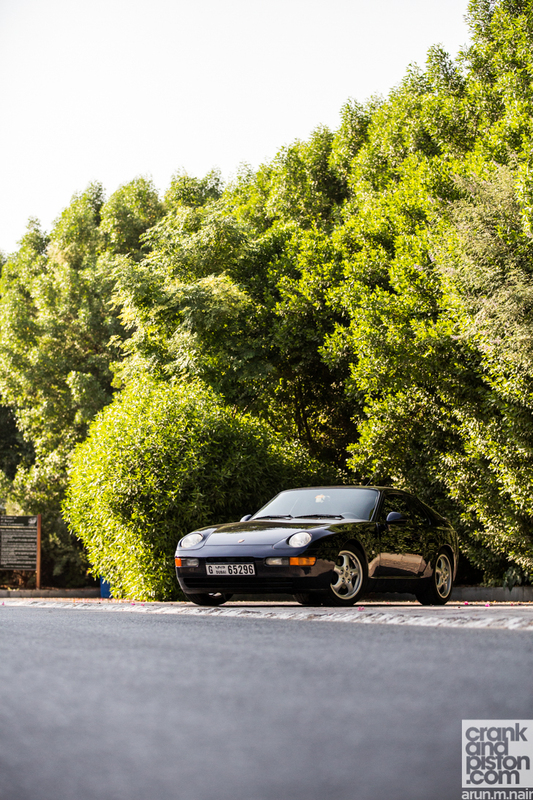 An opportunity that, despite Marcus being a member of Porsche Club UAE, rarely hits the track nowadays: his first such event, just one week after purchase, ended at 1am at the Yas Marina Circuit with a broken clutch. In fact, so keen is Marcus to preserve his ’94 coupe that it’s new home is a lock-up in his native UK, under the watchful eye of his father until such a time that Marcus himself returns. Certainly not. 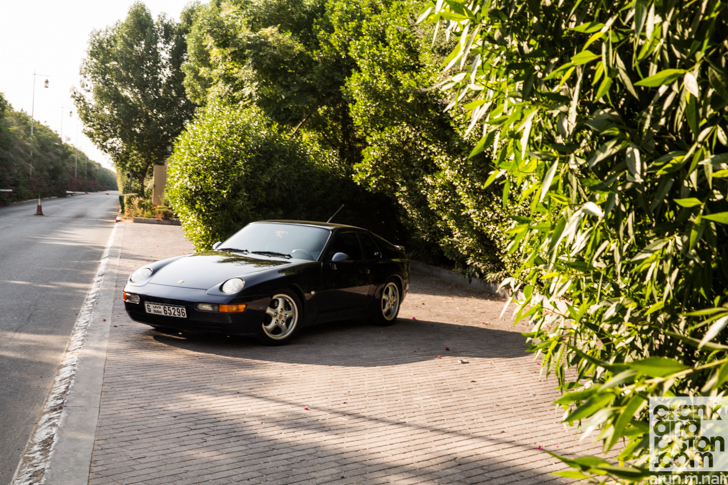 Under the beating sun we’ve all begun to wilt, and the Porsche 968 Club Sport has barely broken sweat. Nor should it. It’s badass, remember? At the press launch of the 2015 Porsche Macan, the automaker cited research showing how the luxury small-crossover segment has grown 185 percent since 2007, to some 1.3 millions units worldwide. Such entries as the Audi Q5, BMW X3, Range Rover Evoque, Lexus RX, and Mercedes-Benz GLK have obviously resonated well with buyers. And the research projects that through 2024 the segment will grow another 3.4 percent annually. In other words, there are a lot of high-priced, high-profit SUVs to be hocked over the next decade. Of course, Porsche didn’t require any research to realize it needed in on this especially lucrative proposition. Enter the Porsche Macan. Based on the Audi Q5, the two-row, five-seat Porsche Macan — its name is derived from the Indonesian word for tiger — starts at a “mere” $50,895, making it the second-least-expensive vehicle in the Porsche portfolio, at $300 dearer than a base 300-hp Porsche Cayenne. That price tag designates a Porsche Macan S, whose 340-hp, 339-lb-ft twin-turbo 3.0-liter V-6, seven-speed dual-clutch PDK automatic, and Porsche Traction Management (PTM) all-wheel drive are good for 0-60 mph in as little as 5.0 seconds and a top speed of 156 mph. Step up to the 400-hp, 406-lb-ft twin-turbo 3.6-liter V-6 Macan Turbo, which improves the previous stats to a manufacturer-estimated 4.4 seconds and 164 mph, respectively, and you’ll shell out $73,295. Still, even at those eye-opening prices, Porsche plans to sell at least 50,000 Porsche Macans per year, with the flexibility to increase capacity if demand calls for it. All Porsche Macans will be built alongside the Porsche Cayenne and Panamera at the Leipzig factory where Porsche recently invested 500 million euro and added 1500 jobs. With diesel and plug-in hybrid variants in the pipeline (the 258-hp, 428-lb-ft turbo 3.0-liter diesel is confirmed for calendar year 2015), Porsche Macan capacity will be going nowhere but up. One survey of the Porsche Macan’s steel and aluminum façade, and it’s easy to see the family resemblances to the Cayenne (front), and to some extent, the Porsche 911 (rear). Michael Mauer, vice president of style at Porsche, takes pride in his new crossover’s coupelike profile (the slant of the rear window is severe, but still allows for 17.7 cubic feet of cargo with the rear seats up) and accentuated rear shoulders that highlight the use of mixed-size tires (as wide as 265 mm front and 295 rear). There’s even a Porsche 918 – inspired profile “blade” that comes standard in black (S) or body color (Turbo), with a $1390 option to go with carbon fiber. 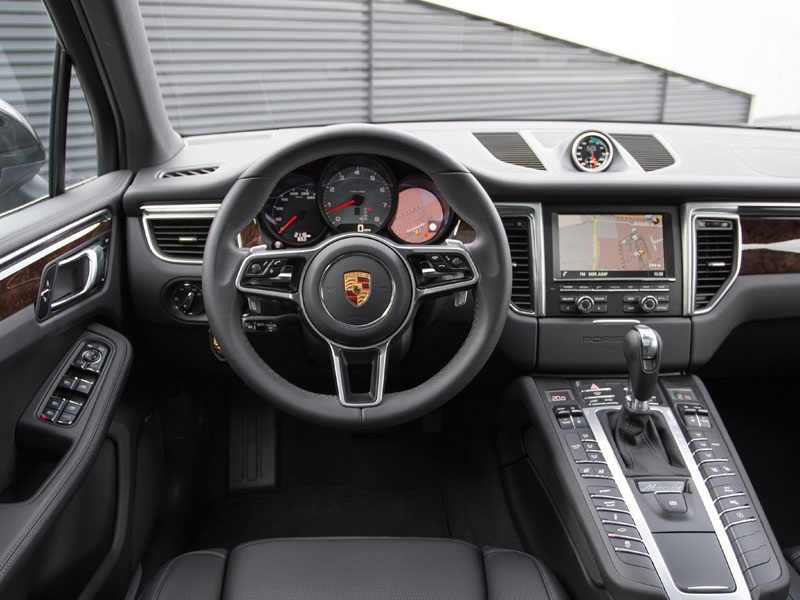 Speaking of the 918, its steering wheel was used as the basis for the one in the Porsche Macan, whose interior treatment — round gauges, 7-inch touch screen, and button-heavy center tunnel — otherwise smacks of Porsche Cayenne and Panamera. 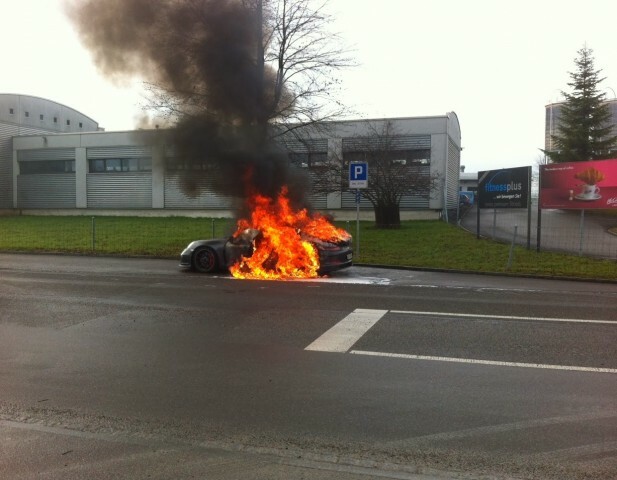 My drive began on Porsche’s FIA-certified 2.3-mile road circuit that sits adjacent to the Leipzig factory. 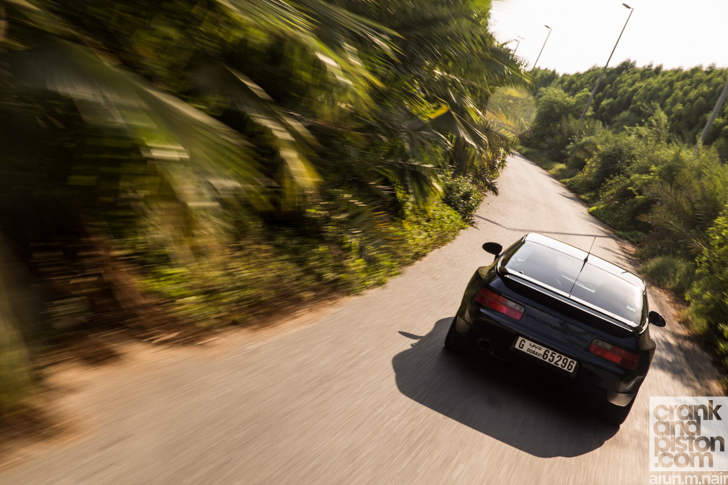 Every new Porsche that rolls out of the plant is taken on an evaluation run on this demanding track. First up: an S fitted with all-season tires (summer tires are a no-cost option), $1360 Porsche Active Suspension Management (PASM), $1490 Porsche Torque Vectoring Plus (PTV Plus), and $1290 Sport Chrono Package that includes launch control and a Sport Plus button. No surprise, the dynamics were excellent for a roughly 4100-pound, 63.4-inch-tall crossover. Despite the all-season rubber limiting grip and producing more understeer than desired, the S proved predictable, fun, and plenty quick, its PTV Plus showing a grin-inducing propensity for rotating the rear under acceleration. Moreover, the brakes — front 13.8-inch discs with six-piston calipers, rear 13.0-inch discs with single-piston calipers — — xt up was the Turbo. It, too, was fitted with all-season tires, PASM, PTV Plus, and Sport Chrono. Notable upgrades included the brawnier engine, larger 14.2-inch front/14.0-inch rear brakes (with red calipers instead of silver), and $2745 air suspension. Downgrade? An estimated 100 extra pounds of curb weight. While acceleration was noticeably better, improvement in handling seemed negligible at best. So unless stoplight drag racing is a priority, stick with the S.
Following the track portion, I sampled a Porsche Macan S with air suspension on the grounds’ 3.7-mile off-road circuit. Though 99 percent of Porsche Macan owners will never venture along topography mimicking the course’s 15 obstacles, which included a rocky climb, a side slant, and a steep ascent that Edmund Hillary would’ve struggled to navigate, it’s reassuring for the one percent to know this “soft-roader” can tackle tough terrain at the touch of a button. When engaged, Off-Road mode optimizes throttle sensitivity, shift points, and torque split to overcome the hairiest of endeavors. And if you are part of the one percent, opt for the air suspension, which raises maximum ground clearance from the steel springs’ 7.5 inches to 9.1, making the standard Hill Descent Control that much more fun to demonstrate. Transitioning from off-road to the real world, the Porsche Macan wasted little time impressing with its luxury, refinement, and athleticism. Along country roads and the autobahn, the S and Turbo pampered drivers and passengers with a quiet, posh cabin; a supple yet sporty ride; and the power and poise to handle triple-digit blasts and meandering sweepers with equal ease. 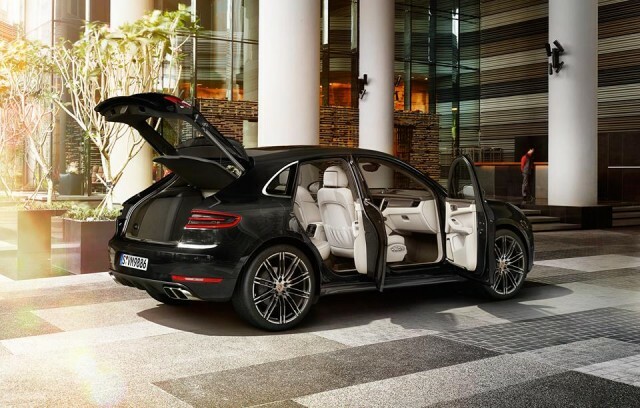 Throw in such options as $1600 Adaptive Cruise Control, $1380 Lane Keep Assist with Lane Change Assist, $1050 front/rear heated seats, $3140 Porsche Communication Management (PCM) with navigation (standard on Turbo), and $5690 Burmester High-End Surround System, and the Porsche Macan is a safe and sumptuous place to motor. Matthias Müller, chairman of the board at Porsche, called the Porsche Macan “the right vehicle at the right time,” adding that it would not only “win over completely new customers,” but also “keep current customers happy.” I’m inclined to agree. After all, based on the undeniable success of the Porsche Cayenne and polarizing Panamera, both initially doubted and ridiculed by Porsche purists and auto experts, there’s no reason to question Müller’s claims. With more than 162,000 vehicles sold worldwide in 2013, he’s proven he can ring a register with the best of them. Nothing could be easier than treating the arrival of Porsche’s second SUV model with a healthy dose of cynicism. Porsche is most famous for its sports cars after all, and putting its badge on a 4WD wagon based on an Audi Q5 hardly seems the kind of cutting-edge engineering that has made the Porsche 911 iconic and delivered virtually every trophy worth winning in the world of motorsport. The only problem is that even running an eye down the Porsche Macan’s specification chart makes for mouth-watering reading. Take the range-topping Turbo: with 294kW of power it has virtually as much grunt as a Porsche 911 Carrera S and with a claimed 0-100km/h figure of 4.6 seconds in the version fitted with launch control, is every bit as fast in a straight line. More importantly, the Porsche Macan Turbo simply can’t be matched in horsepower terms by any rival which, if you believe in marketing-induced categories, includes other “premium” smaller SUVs such as the Range Rover Evoque, Audi Q5, BMW X3 or possibly the smaller Mercedes-Benz GLA. None of these offer supercar performance but then, none approach the Porsche Macan Turbo’s price tag that will be $122,900 when it goes on sale in Australia in June. And while cynics might say that’s the price to pay for a Porsche badge, there’s a reasonable argument that with only a claimed 30 per cent commonality between the Porsche Macan and the Audi Q5 that excludes the petrol engines, all body panels and glass, suspension components, interior and pretty much anything the customer and touch and see, you’re getting quite a bit of Porsche for the money. The same goes for the rest of the range, starting with the $84,900 diesel that Porsche Australia believes will be the biggest selling model. 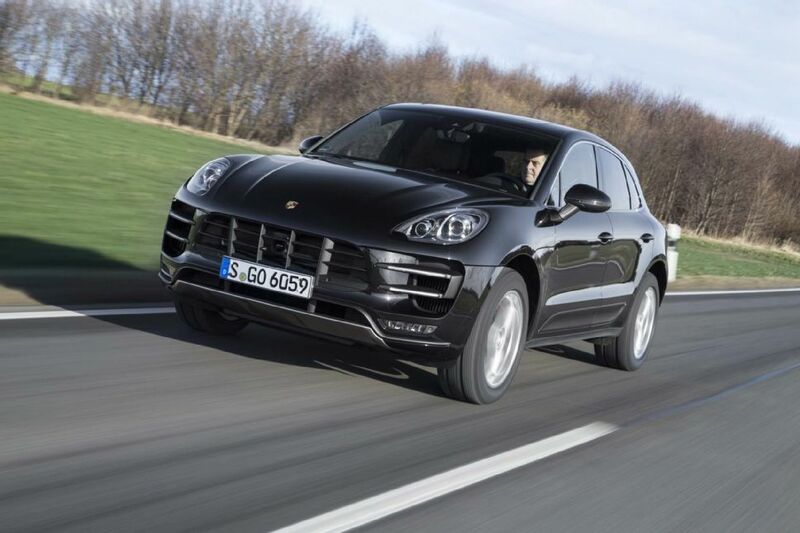 It uses the same 3.0-litre Audi V6 fitted to the larger Porsche Cayenne but puts out an even meatier 190kW of power. Then there’s the Porsche Macan S, which uses a smaller 250kW, 3.0-litre version of the Turbo’s all-new 3.6-litre petrol V6. At $87,200 it is also expected to attract new buyers to the brand and in fact, Porsche Australia reckons only five per cent of Porsche Macan sales will go towards buyers who might otherwise have considered a Porsche Cayenne. That’s partly because of pricing, but also because the Porsche Macan is quite a different type of car despite its visual similarities. At 4681mm long, it’s a good 140mm shorter than its bigger brother and weighs a little less, even if the Turbo comes in at a not insubstantial 1925kg. There are obvious Porsche styling cues such as the rounded headlamps, slatted air intakes and bulbous rear wheel arches, but with features such as a heavily sloping roof and tailgate and a wrap-over “clamshell” bonnet, the Porsche Macan has a tighter and tauter look than the Porsche Cayenne. The idea is to give Porsche-style performance with five-seater practicality and the Porsche Macan does a pretty good job of that. 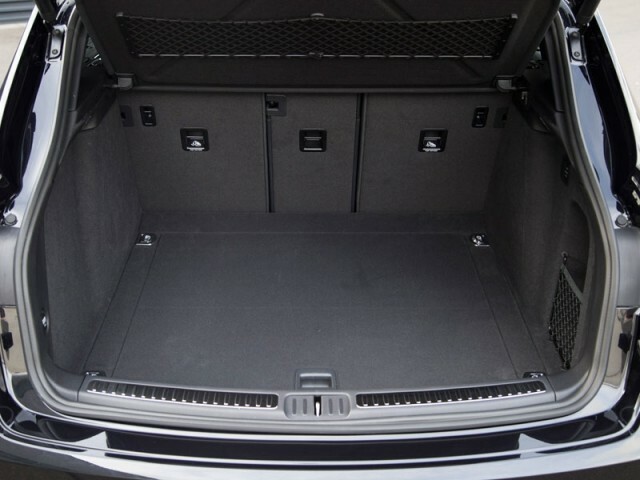 There’s 500 litres of boot space, expandable to 1500 litres once the rear seats are folded flat although there’s no facility to do that from the cargo area. 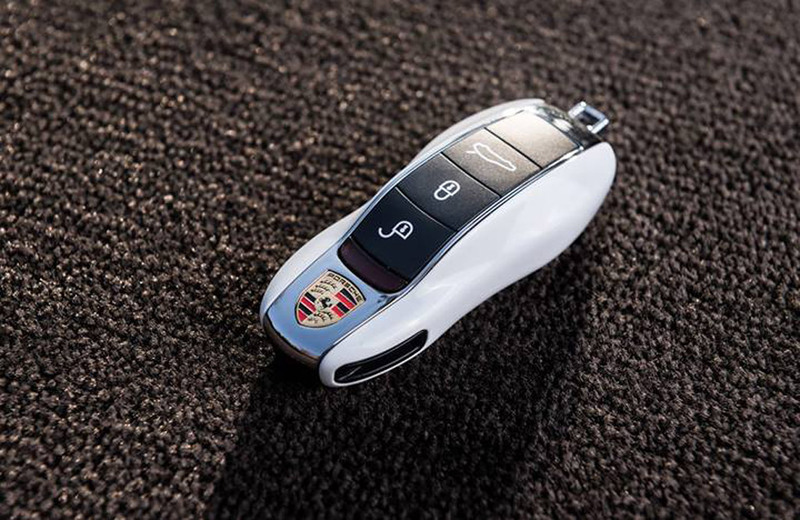 Porsche’s seven-speed dual-clutch automated PDK gearbox is the only transmission choice, although all Porsche Macan models feature four-wheel-drive. 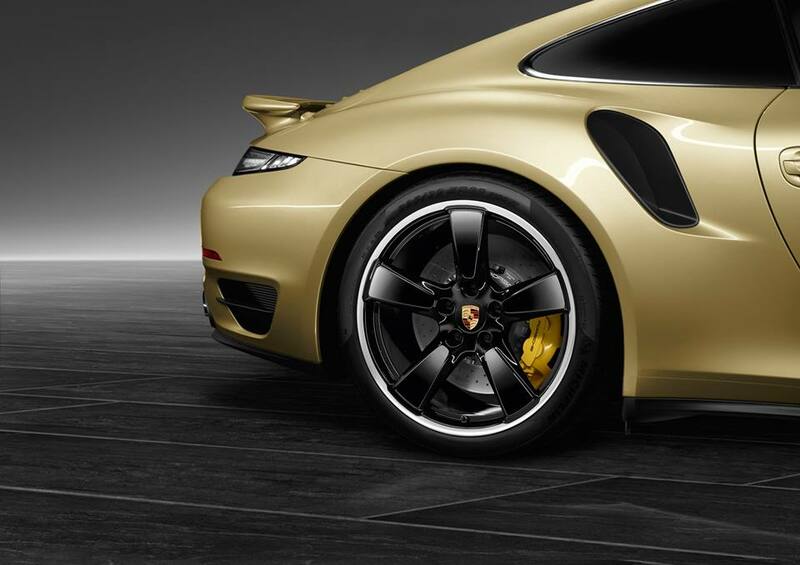 It’s also Porsche’s own system, based on that found in the Porsche 911 Carrera 4 sports car that in normal circumstances sends drive to the rear wheels, but apportions torque forward when wheel slip is detected. All three models come with conventional coil-sprung suspension, although the Turbo gets Porsche’s PASM electronically controlled dampers. Air suspension will be optional across the range, although there’s no word yet on how much extra it will cost. 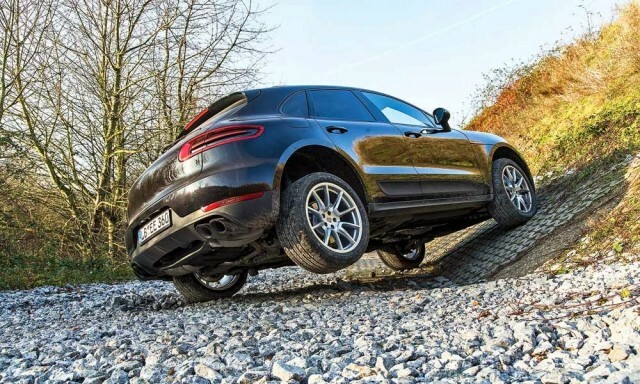 Like other options such as ceramic composite brake discs that are pricey options on the Porsche Cayenne, the air suspension is unlikely to come cheaply. 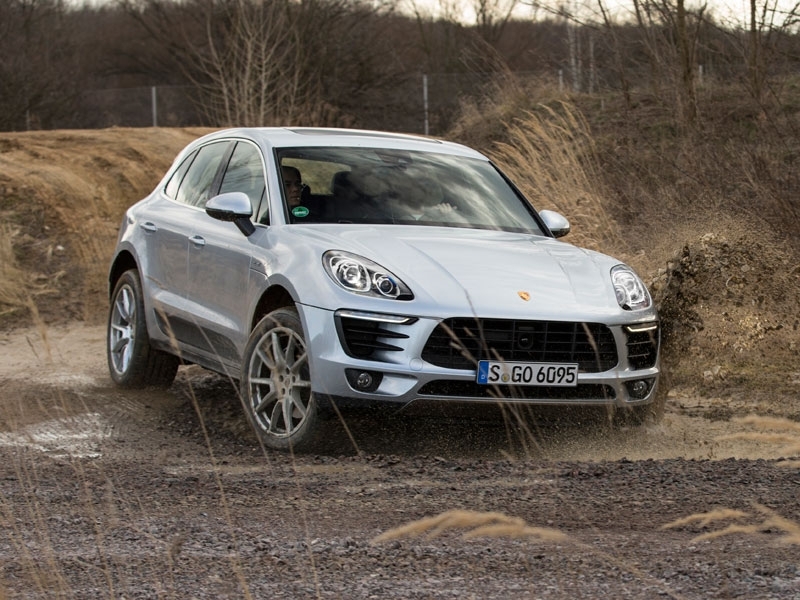 Despite performance figures that seem more in the supercar realm – the Turbo model fitted with optional launch control as part of the Sports Chrono package will hit 100km/h in a claimed 4.6 seconds from standstill – the Porsche Macan was also designed for off-road use. To that end, there are features such as an off-road program for the combined 4WD, traction control and transmission systems, plus hill descent control. Short overhangs help provide descent approach and departure angles on steep hills, and the Porsche Macan’s ground clearance of 198mm can be increased to 230mm in vehicles with adjustable air suspension. Fuel consumption is aided by features such as auto stop-start and active aerodynamics that close off cooling openings at speed but as could be expected, the almost two-tonne Turbo is no fuel-sipper, consuming a claimed average 9.2 litres per 100km, while producing 216g of carbon dioxide per kilometre. The diesel variant does better at 6.3 L/100km and 164g/km, and still manages a decent turn of speed with 100km/h coming up in 6.3 seconds (or 6.1 with launch control). Being the cheapest Porsche in 30 years will no doubt help the Porsche Macan take over the Cayenne’s crown as the best-selling model as well, but there’s more to this car than just a vaguely accessible price. 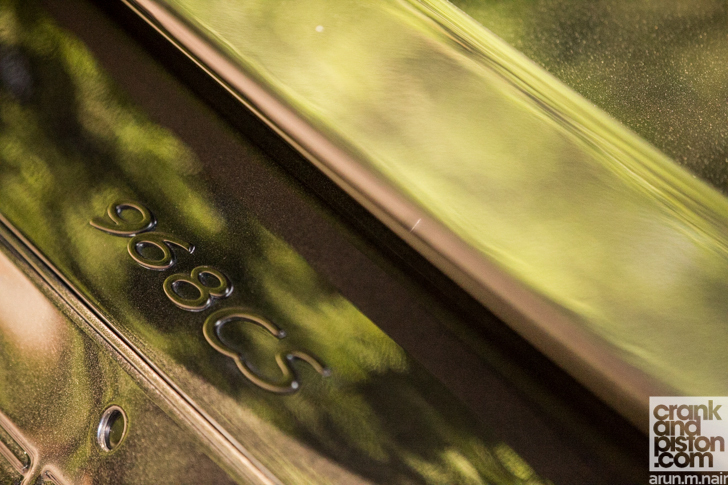 Performance, the promise of better than average handling, the capacity to carry at least four passengers in comfort and more than a modicum of off road ability point to a car that’s deserving of the Porsche badge. After over two years of construction and roughly 500 million euros ($684 million at current rates) invested, Porsche finally opened its Leipzig, Germany, factory expansion on February 11. 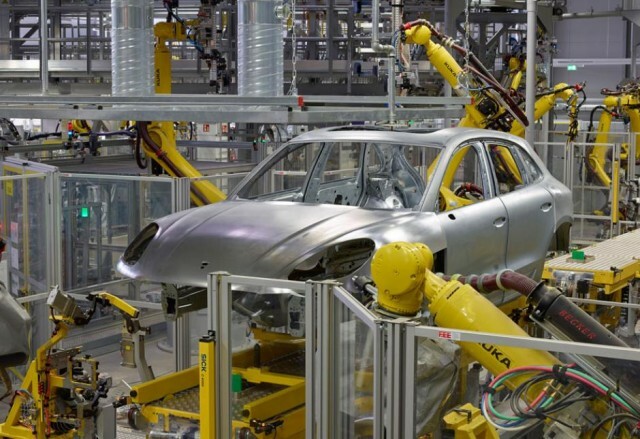 The improvements to the plant are dedicated to building the Porsche Macan and include a new body shop, paint shop and assembly line that are advancing Porsche’s goal to sell 50,000 Porsche Macan’s per year. 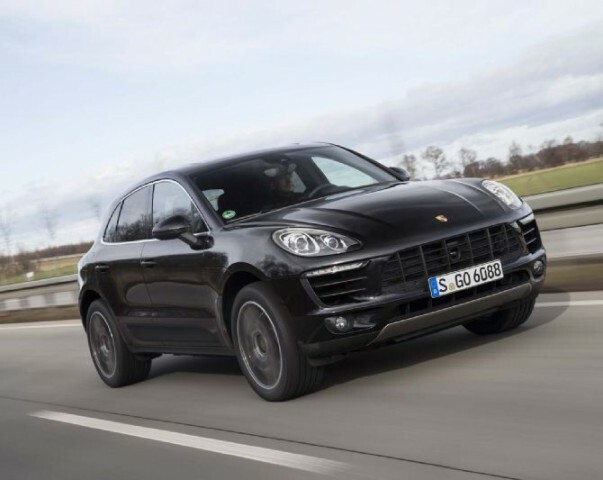 The company believes that the new model is going to push it to over 200,000 annual sales 3 years ahead of schedule, and the enlarged branch can support even more Porsche Macan production, if there is demand. 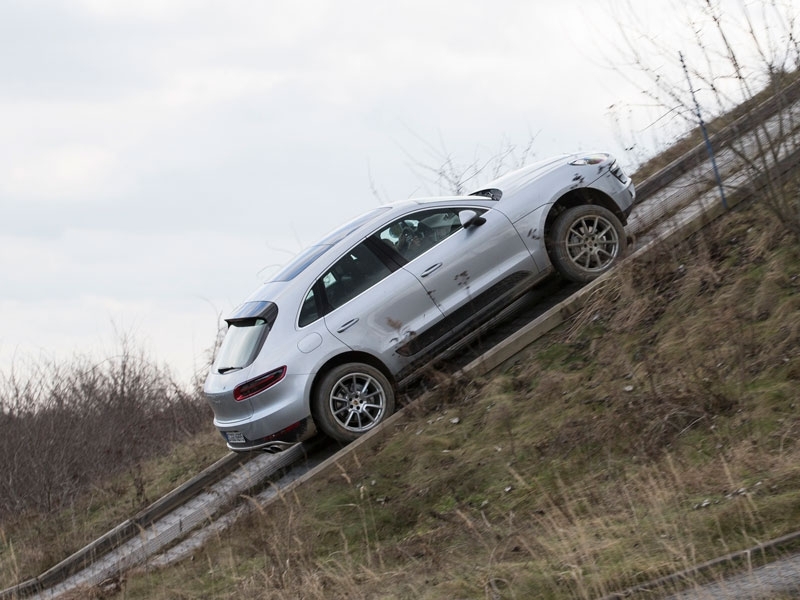 “We are totally convinced in the qualities of this location and that the Porsche Macan will be a marketing success,” said Porsche Chairman Matthias Müller during the opening celebration. 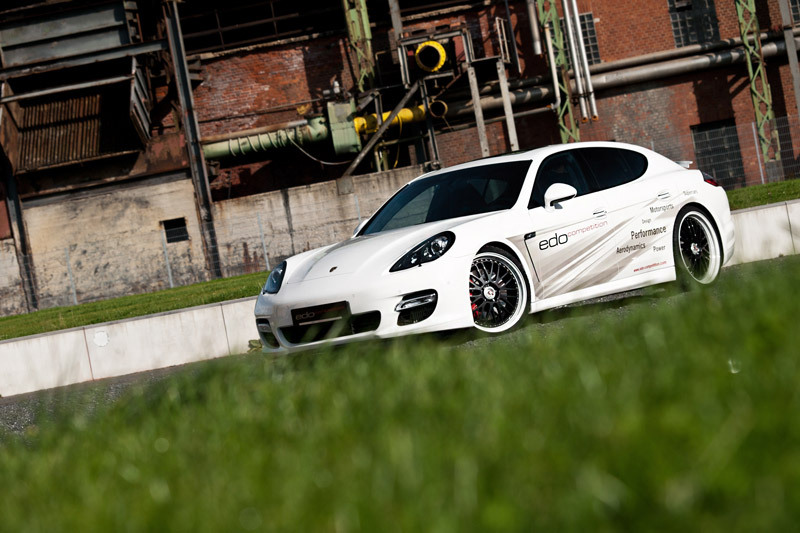 The company opened its Porsche Leipzig factory in 2002 to build the Porsche Cayenne and added Porsche Panamera production in 2009. The Porsche Macan models are due to launch in the US this summerwith prices starting at $49,900. 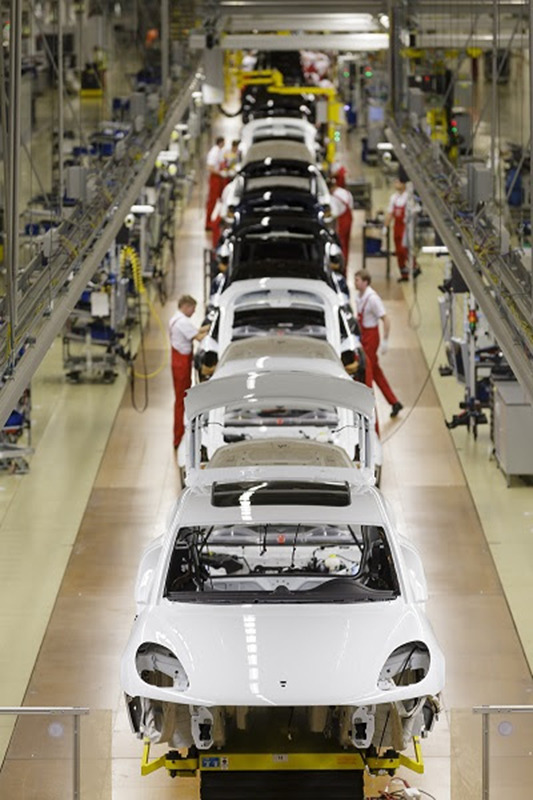 Scroll down to learn all of the details about the Macan’s Leipzig assembly plant. Porsche’s fifth model line, the new Porsche Macan S and Porsche Macan Turbo, will arrive at U.S. dealers this summer and will become true sports cars in the rapidly growing segment of compact SUVs. The Porsche Macan S is powered by a 3.0-liter twin-turbo V6 engine with 340 hp and can accelerate from zero to 60 mph in 5.0 seconds. 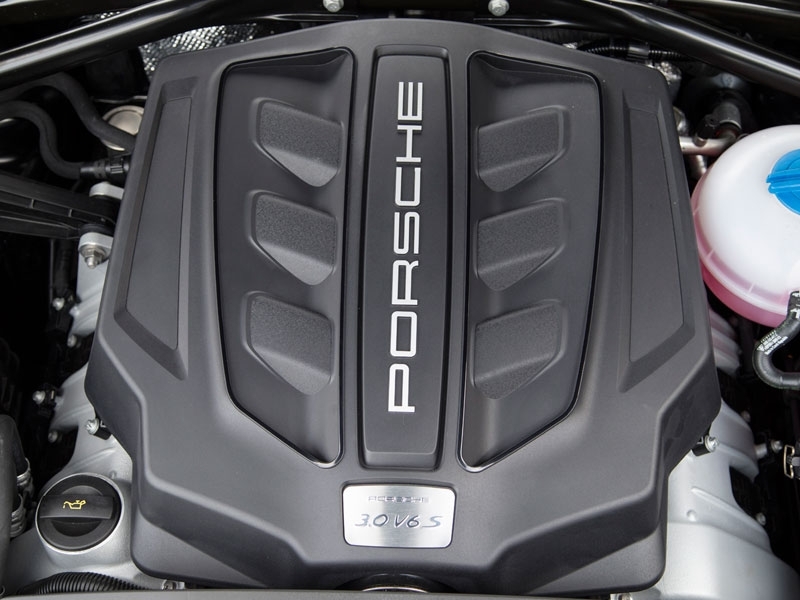 The 3.6-liter twin-turbo V6 in the Porsche Macan Turbo produces 400 hp and makes the car sprint from zero to 60 mph in 4.4 seconds. As the Sochi Olympic Games kicked off Friday in Russia, tennis champion Maria Sharapova wasn’t simply there for the torch-lighting ceremony. 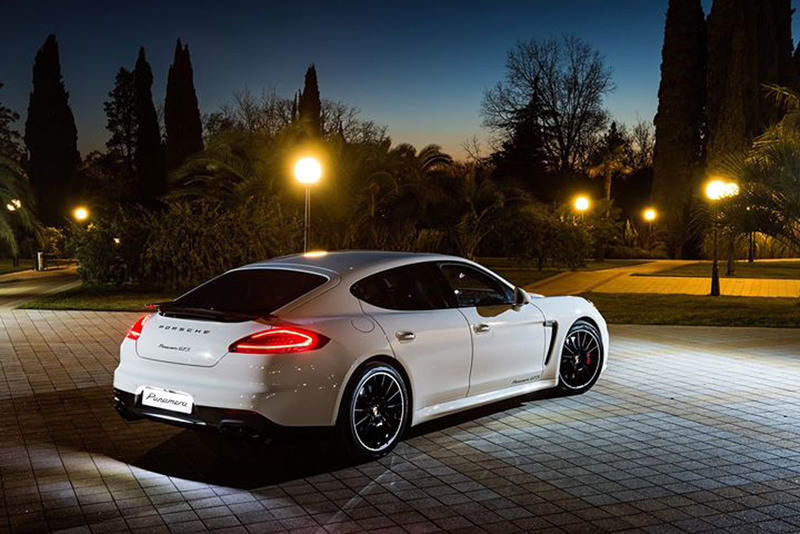 She took delivery of a very special 2014 Porsche Panamera GTS to demonstrate how far Porsche goes to satisfy its high-end customers. 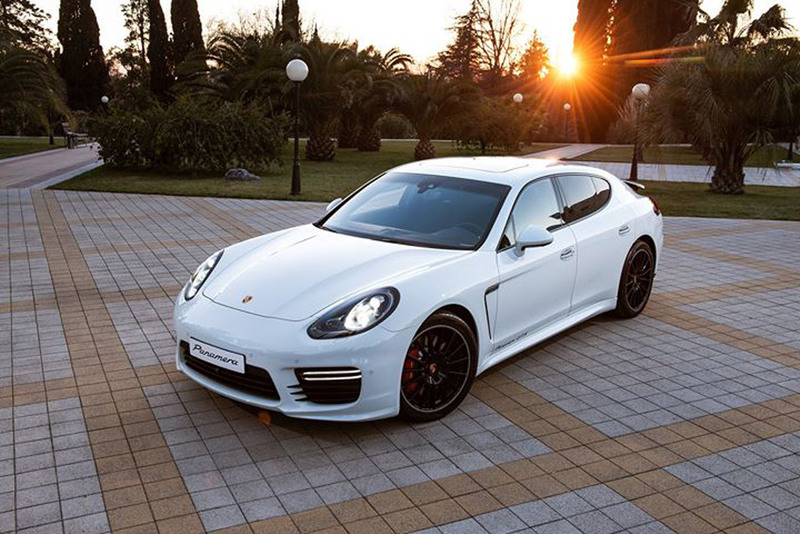 Given that sport competition is a central theme in her life, Maria Sharapova went with the most athletic of the 2014 Porsche Panamera range, the GTS, which she chose to have painted white. Special edition Maria Sharapova Panamera GTS – touches include black gloss trim used for the headlight surrounds, wheels and window trim. Sharapova also chose to have the taillights tinted and black tail pipes added to the car’s sports exhaust system. 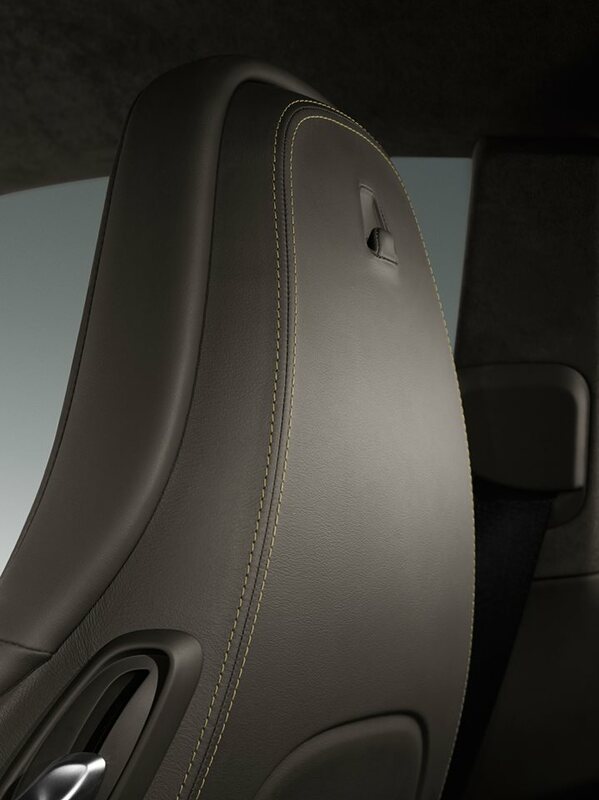 Inside, she chose the extended leather trim option and contrast stitching. 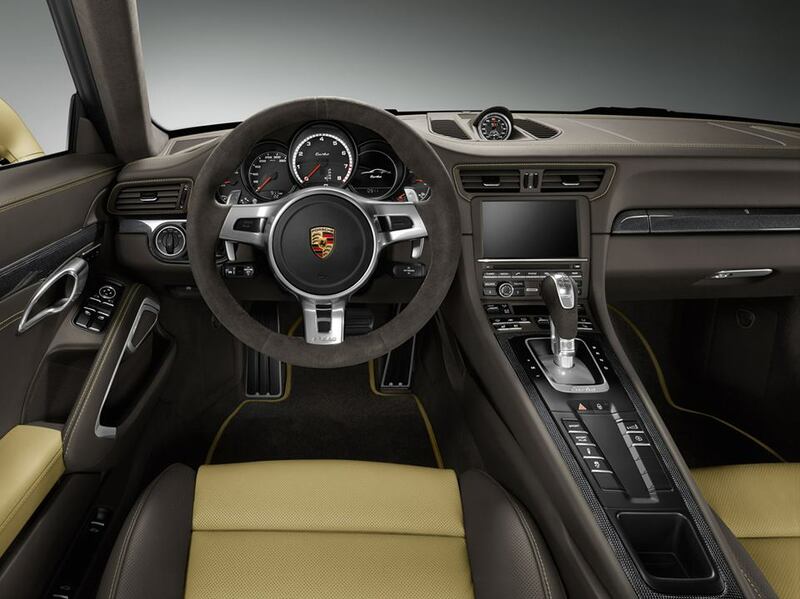 The instrument dials have also been painted to match the body and the headrests embossed with the Porsche crest. 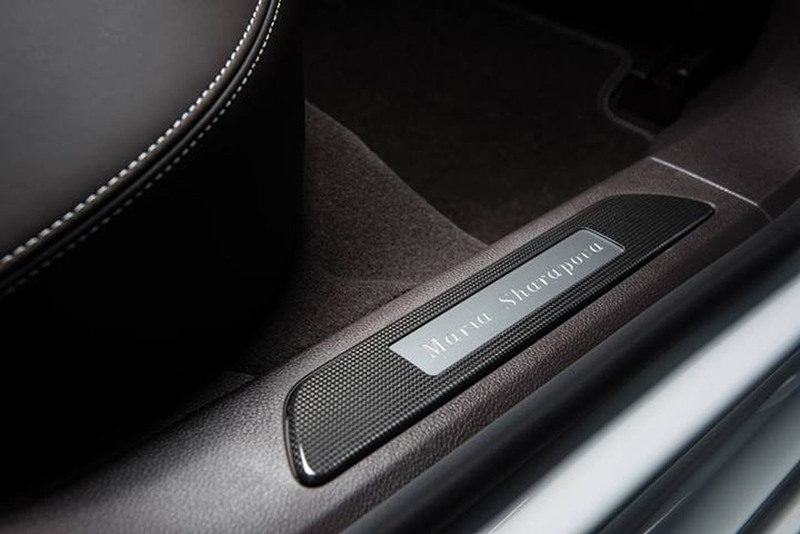 The final touch is a set of carbon door sills with Sharapova’s name emblazoned on them. 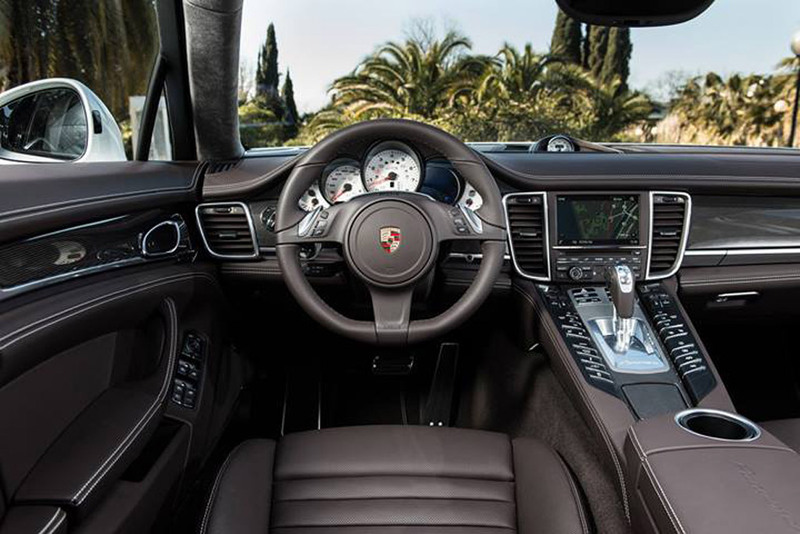 The Maria Sharapova’s Porsche Panamera GTS was introduced for the 2013 model year and comes with a naturally aspirated 4.8-liter V-8 good for 440 horsepower and 383 pound-feet of torque. It needs just 4.5 seconds to sprint to 60 mph and will hit a top speed of 178 mph. Off the tennis court, Sharapova has dabbled in product design — “full collections of luxury accessories, apparel, and even candy,” according to Porsche — and adding this Panamera GTS is an unexpected addition to that list. 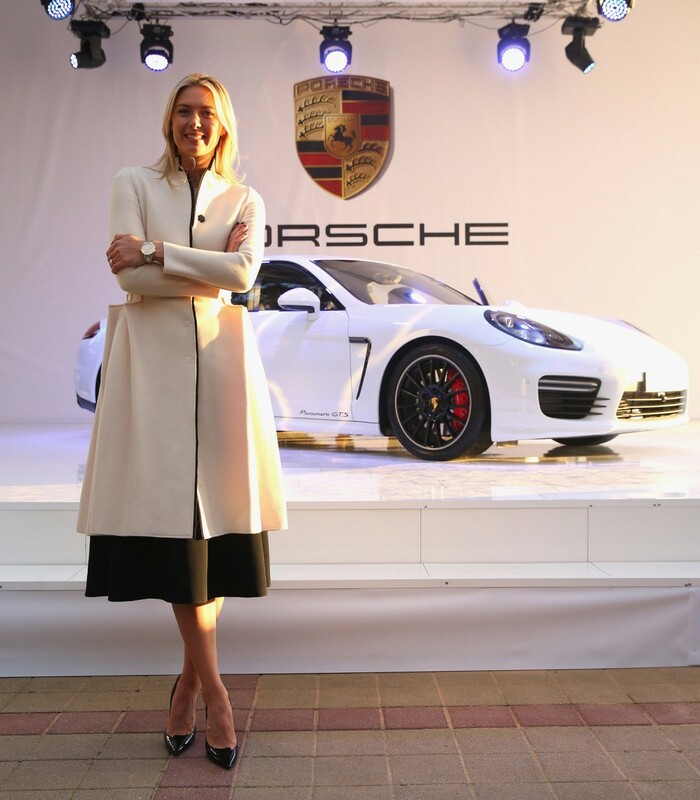 When she was signed last year, Porsche CEO Matthias Muller said Sharapova was “the perfect choice” to represent Porsche since she “combines top performance in her sports with elegance and power.” Other automakers, especially Audi, pay similar celebrities to drive their cars and smile for the cameras at big events like the Sochi Olympics. 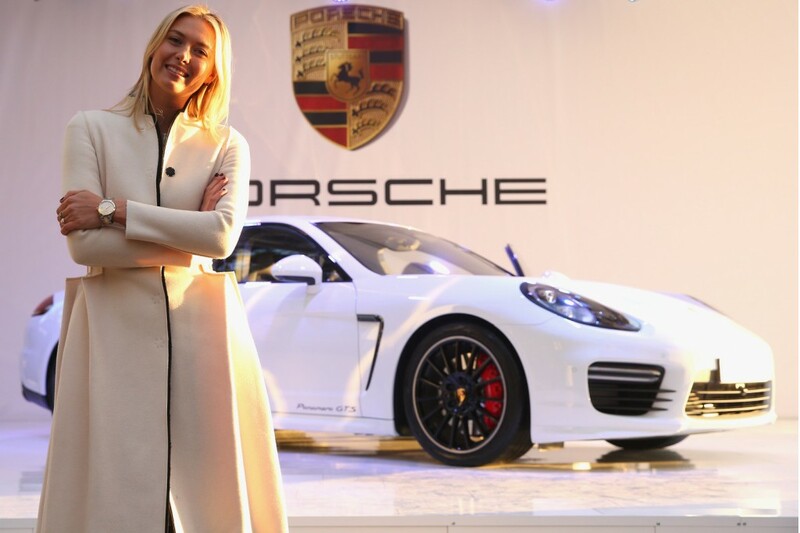 In April last year, Porsche struck a deal with Sharapova to make the 26-year-old Russian superstar athlete the automaker’s first-ever brand ambassador. She then helped introduce Porsche’s all-new small SUV, the 2015 Macan, at the Los Angeles Auto Show in November. Create a compact SUV? No, we’d rather think outside the box. We’ve created what we always create: a sports car. Five doors, five seats and yet intimate with the road; boasting plenty of space for hobbies, leisure and sport. But no room for compromise. Compact, concentrated and intensive, but still powerful. Practical but never ordinary. The new Porsche Macan – built for an intensive life in which the thirst for experience and thrills and spills are ever-present, and in which new challenges are a permanent driving force. Built for a life that refuses to be hemmed in by conventions and feels all the more authentic for it. Direct and intimate. A sports car that gives us what we´re looking for: that feeling of being alive. The hood stretches through to the wheel arches, lending the front a broad and powerful presence. This extraordinary styling element is also a reminder of the legendary Porsche 917, a winner of countless races in its time – including the 24 Hours of Le Mans. 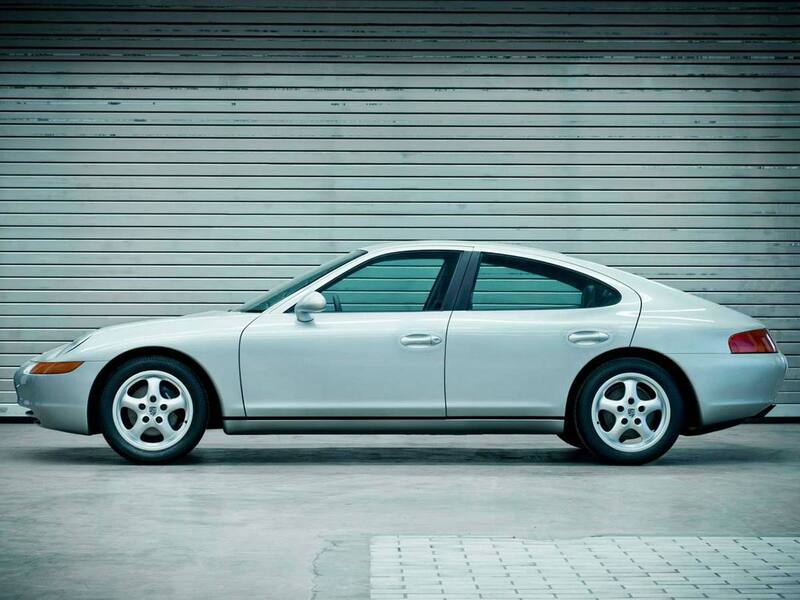 The side profile is distinctly Porsche. From this angle, the front end resembles a predator waiting to pounce. The roof line slopes distinctively down towards the rear, drawing the customary sports car contour – our designers call it the Porsche flyline. The side blades are striking, with a design that pays homage to the futuristic 918 Spyder super sports car and makes the doors appear narrower, the flanks much sleeker and even sportier. It is available in carbon fibre, painted in the respective exterior colour or in Lava Black. In sizes of up to 21 inches, the wheels are also testament to the high standards that can be achieved in car design. 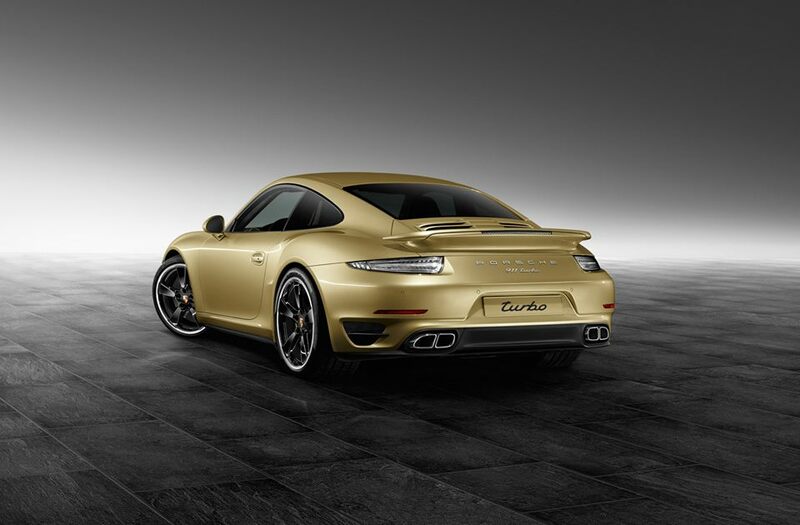 The rear end, slender at the top, widening into broad shoulders above the rear wheels – a homage to the Porsche 911 Sports car. The styling of the hatch – without handle and attached licence plate – shows off the line of the cast-moulded rear. The narrow LED taillights have three-dimensional proportions, which give them an extraordinary appearance of depth – another inspiration by the Porsche 918 Spyder. Sporty genes are obviously dominant in this hereditary line. It is our firm belief that driver and car must form a single entity. 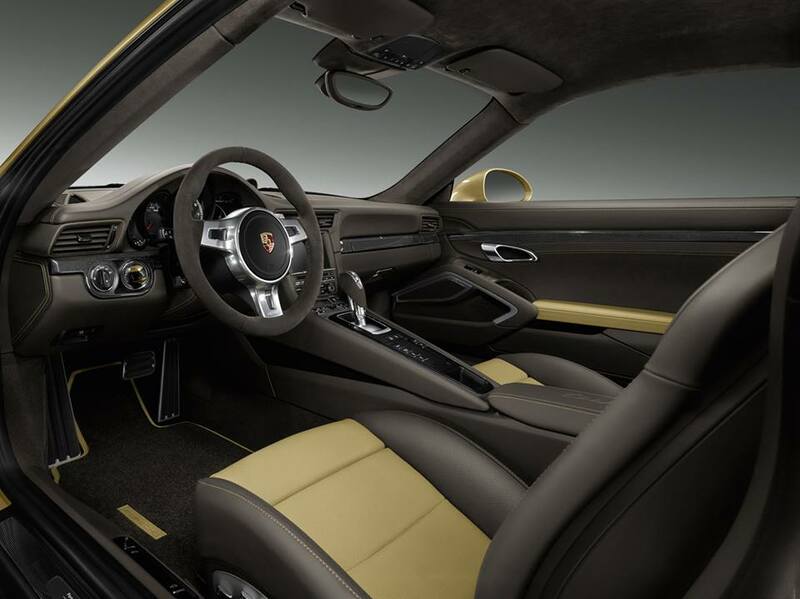 As such, you do not simply sit in the Porsche Macan – the ergonomic architecture integrates you into the vehicle. The essentials are seen at a glance and positioned close at hand. The instrument panel has a three-tube design and the rev-counter is positioned in the center, exactly where it belongs in a sports car. As ever, the ignition is on the right. 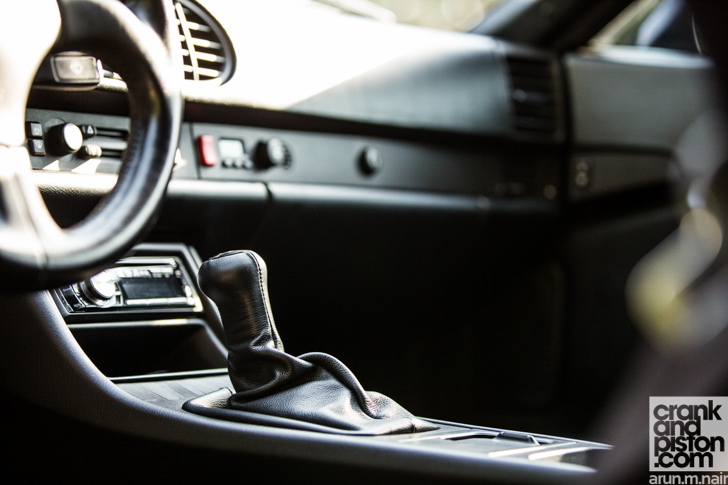 The ascending center console – a typical feature of a sports car – shortens the reach between the steering wheel and the gear selector and control buttons and further intensifies that sports car feel. And what about flexibility? There’s plenty of that, too. 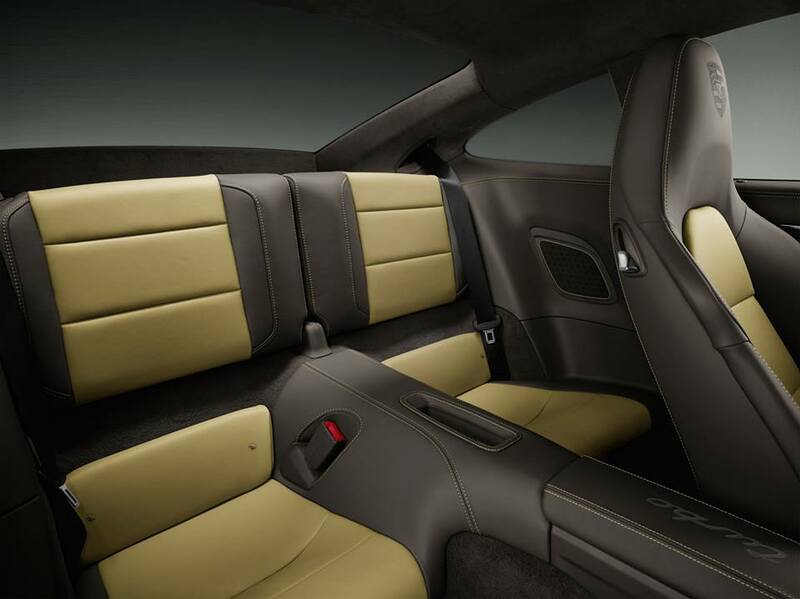 The interior boasts a luggage compartment volume of 500 litres. With the flexible three-way rear bench seat folded down, this can even be increased to 1,500 litres. 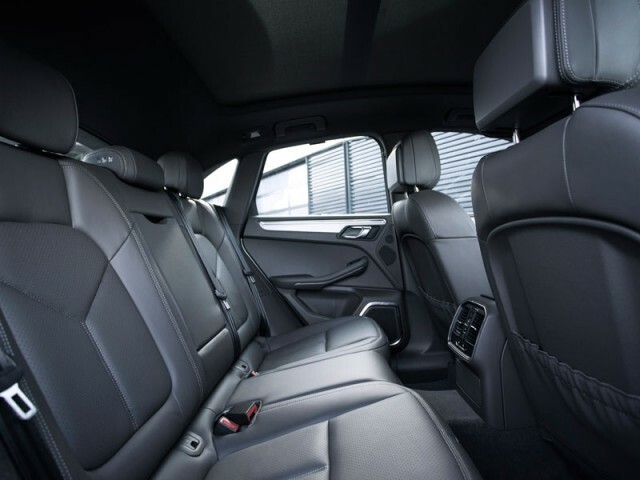 A wide range of materials, trims and colours is available for you to make the interior even more exclusive, even more sporty and even more individual. The distinctly muscular front apron, with the side airblades of the conspicuously large cooling air intakes, is found nowhere else but on the Porsche Macan Turbo. A promise of thrilling performance. The Porsche Macan Turbo also stands out thanks to its front spoiler lip, the design of which is based on that of the Porsche 918 Spyder, and the direction indicators and position lights, which appear to hover inside the side air intakes. 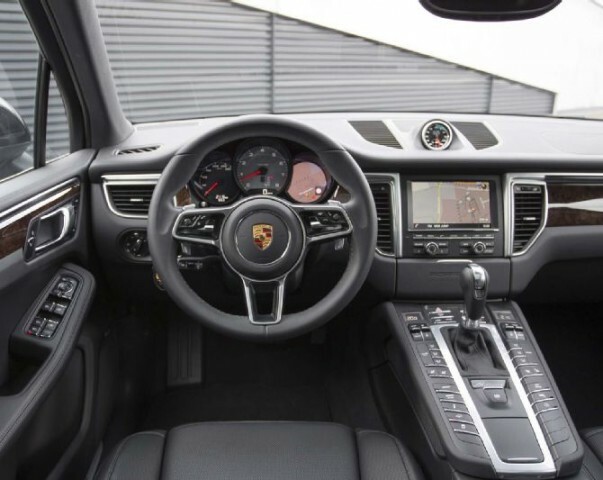 The Porsche Macan Turbo also features Bi-Xenon headlights including PDLS, Porsche Active Suspension Management (PASM), 19-inch Macan Turbo wheels, red brake calipers with enlarged brake discs, side blades painted in the exterior colour, a leather package, adaptive Sports seats, Porsche Communication Management (PCM) with a large touchscreen, and the BOSE® Surround Sound System. Offering a total output of 545 watts and with 14 loudspeakers including subwoofer, it delivers a special listening experience. Fuel consumption* Macan : Urban in l/100 km (mpg) 11.8 (23.9)-6.7 (42.2); Extra urban in l/100 km (mpg) 7.8 (36.2)-5.7 (49.6); Combined in l/100 km (mpg) 9.2 (30.7)-6.1 (46.3); CO2 emissions in g/km 216-159. Impressively, the 3.6-litre twin-turbo V6 engine delivers an enormous power output of 294 kW (400 hp). The sprint from 0 to 62 mph is completed in a mere 4.8 seconds. Top speed is 165 mph. And that’s all achieved with moderate emission and fuel consumption figures. This active all-wheel-drive system with variable torque distribution delivers engine power precisely to the road. By means of continuous monitoring of driving conditions, the system is able to respond to a variety of situations and adapt to your driving style. The electronically controlled clutch helps to ensure optimum distribution of force to all four wheels on road surfaces with irregular grip. The torque split between the front and rear axles is therefore fully variable – up to 100 % if necessary. 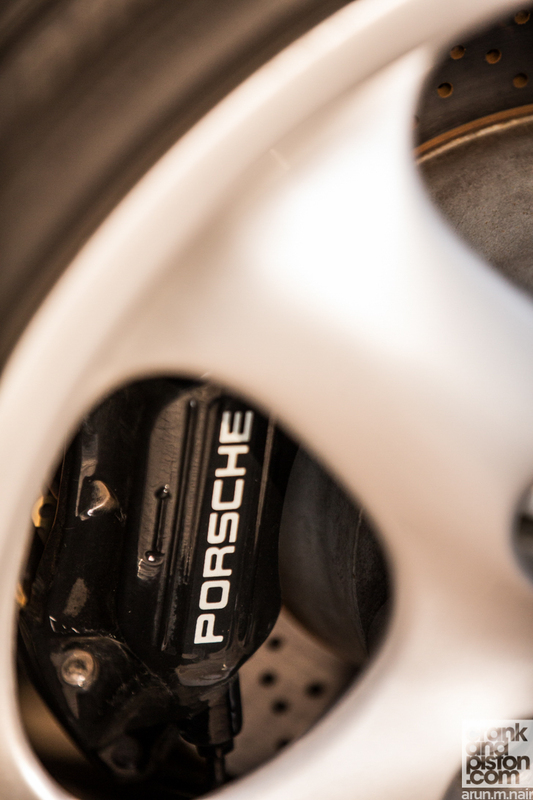 In addition to traction, driving safety and outstanding steering performance, Porsche Traction Management (PTM) enables a high degree of driving stability, exceptional handling and excellent dynamics. 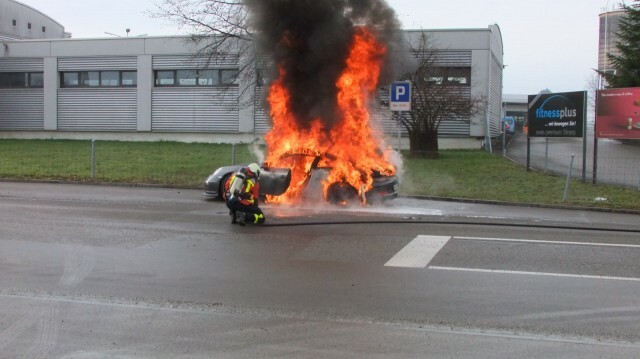 In short, typical Porsche driving qualities. 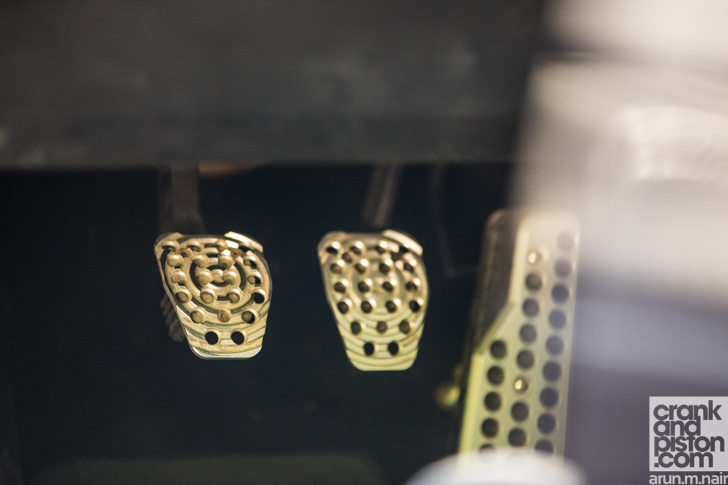 The V6 biturbo engines feature 2 parallel turbochargers – one for each cylinder bank. The intake air is compressed and delivered to the engine via one charge air cooler for each cylinder bank. This cooling serves two purposes: a high cylinder charge and low component temperatures. 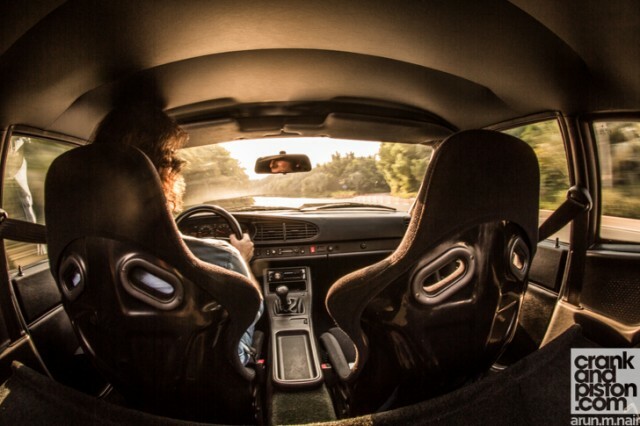 For many, listening to music and driving a car is a natural combination. The Burmester® High-End Surround Sound System turns the experience into an emotional event of the highest sound quality. It was co-developed in Weissach and in Berlin – by one of the most respected manufacturers of high-end audio equipment worldwide. The figures alone sound impressive: 16 amplifier channels with a total output of more than 1,000 watts, 16 loudspeakers including a 300-watt active subwoofer with class D digital amplifier. 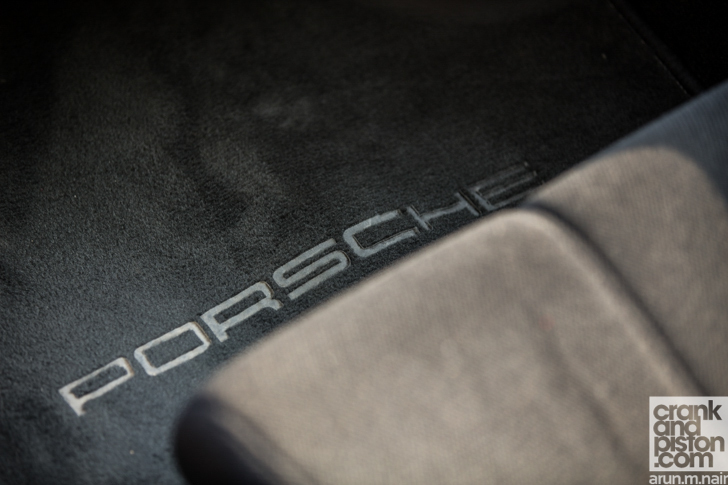 Since 1986, Porsche Exclusive offers almost endless possibilities to personalize your Porsche. 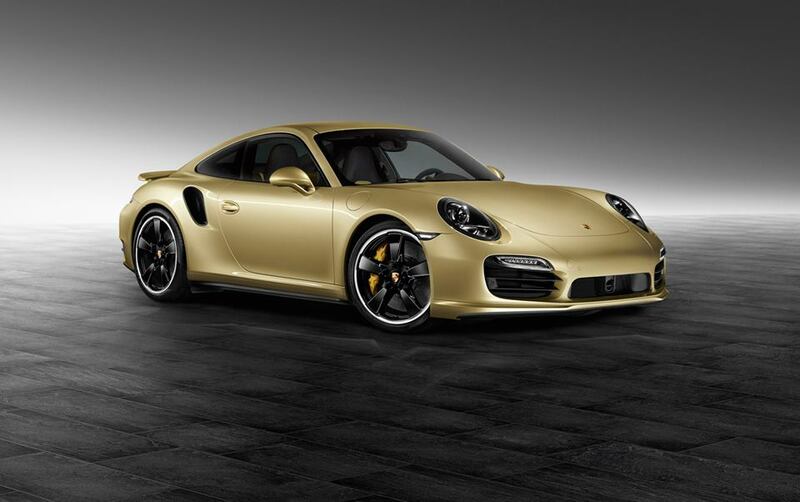 One of the latest examples is this new 911 Turbo in Lime Gold Metallic. As you can see in this gallery the exterior colour is not its only special feature.